By partnering with the Junior League of Hampton Roads, your company will be sponsoring an established 501(c)(3) non-profit organization that is making an impact in the Hampton Roads community. Your investment will support training and community programs which are dedicated to the wellness of women in our community, and you will be recognized as a community leader in these efforts. Sponsorship levels and benefits can be customized to meet your company’s needs and goals. We welcome interest at all levels, and happily accept all forms of engagement and support from our corporate partners. 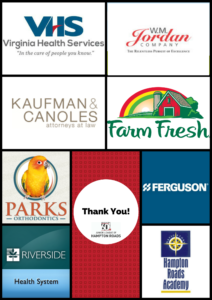 In addition to financial sponsorship, the Junior League of Hampton Roads also gratefully acknowledges in-kind sponsorship from companies whose donations allow us meet the needs of our mission and improve Hampton Roads. Corporate sponsorship benefits may include visibility at our high-profile community events, your company’s name and/or logo and in our Annual Report, marketing on our website and social media outlets, tickets to events, opportunities for your employees to attend training and volunteer events, and more! For more information, contact our Vice President Coordinator, Simcha Terwilliger, here! Thank you to Lemmata Chiro for their recent donation of $3,400 to our League. One of their owners was active in her League in Texas and understood the impact that the Junior League has in the community. These funds will help us to better the Virginia Peninsula community.